The deer now have their full coats and are ready for the cold of winter. The question is whether or not we’re going to have cold weather this winter. Our pattern of frequent rains and mild daytime temperatures seems to be holding strong. That’s not to be taken as a complaint, just an observation. They all look strong and healthy. Their full fluffy coats look very well kept and there are no signs of gauntness or bare ribs. 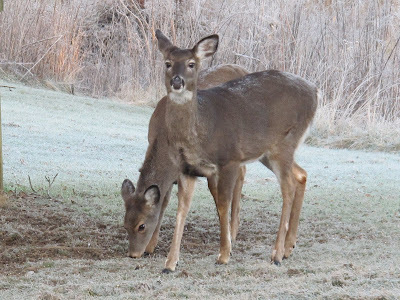 It’s been a while since I’ve seen late December deer looking so fit. Nighttime temperatures still dip below freezing and heavy frosts are a normal morning feature. 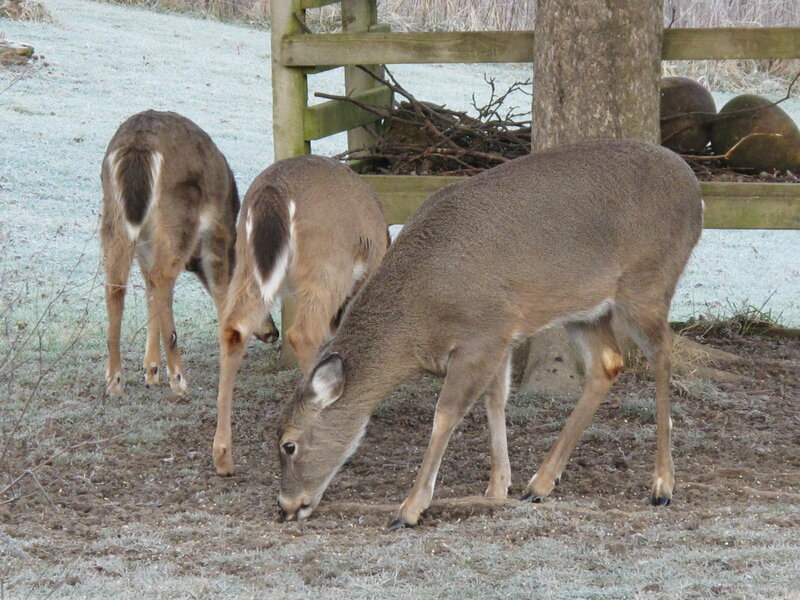 These deer are still carrying a coating of frost on their backs. 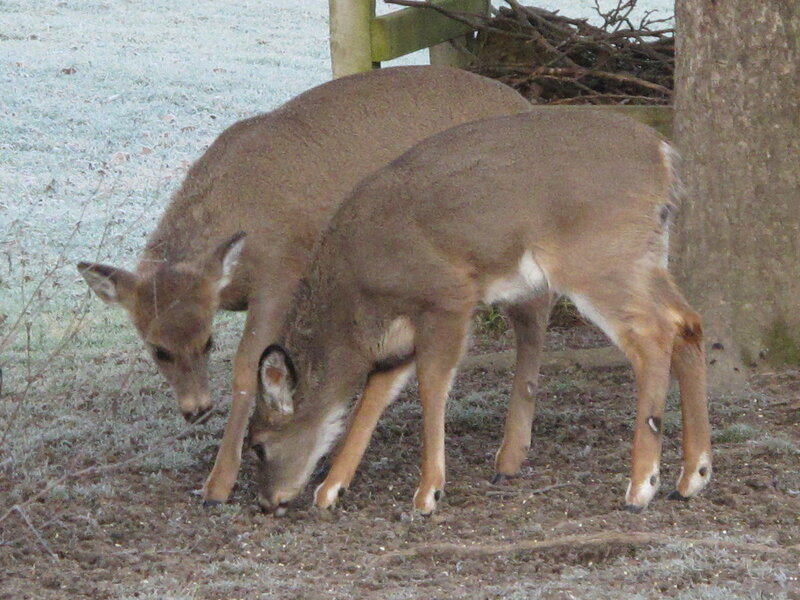 The deer hair provides such superb insulation that body heat won’t melt the frost and the deer don’t feel the chill. The twins are still traveling with their mother. They are totally independent now and don’t look to her for guidance, but they’ll remain companions until next spring. They come looking for cracked corn. Each tiny bit must be picked up individually. They can’t end up with more than a few kernels for their efforts. 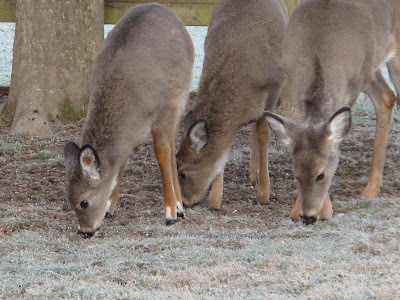 Corn isn’t an ideal food for deer, but what they get here isn’t more than a little treat. 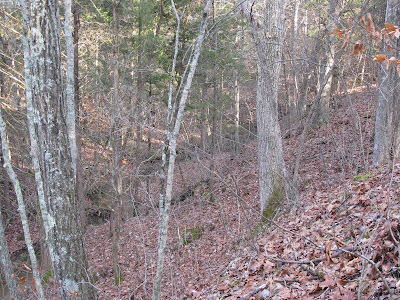 To remain healthy, they need to get out and consume the mixed browse to be found scattered across the fields and woods. The twins may have declared independence, but they still exhibit some traits of young siblings. There’s always that concern that your brother is getting a little more than his fair share. 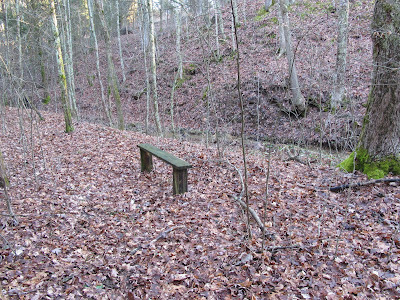 The resting bench sits at the edge of the trail along the creek. It’s a peaceful place to relax. 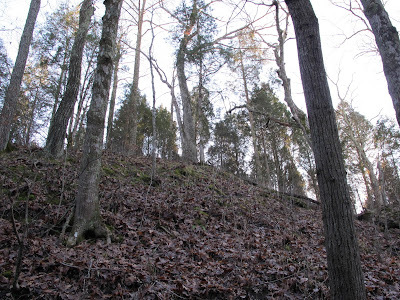 Hills on two sides tend to muffle distant sounds. 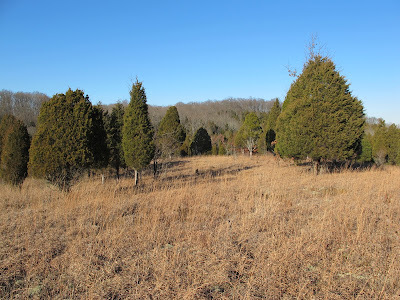 This is also the zone that is so often devoid of birds and other animal life. Maybe the bench itself acts as some sort of talisman that warns away the wildlife. 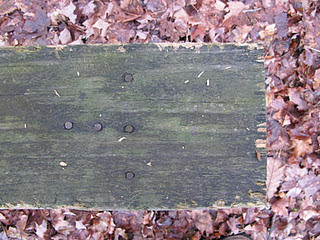 The bench has been in place for 25 years and shows no signs of wear. It seems that a squirrel has chosen this year to chew the edges of the seat. Squirrels are the one animal that I do see at this spot on a regular basis. They often cover the seat with acorn shells, but this is the first time they’ve actually shown aggression towards the bench. 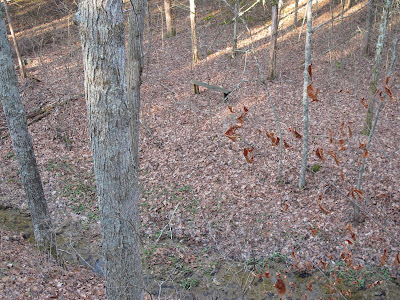 Up there at the top of the slope is where I enjoy the view of the creek from above. 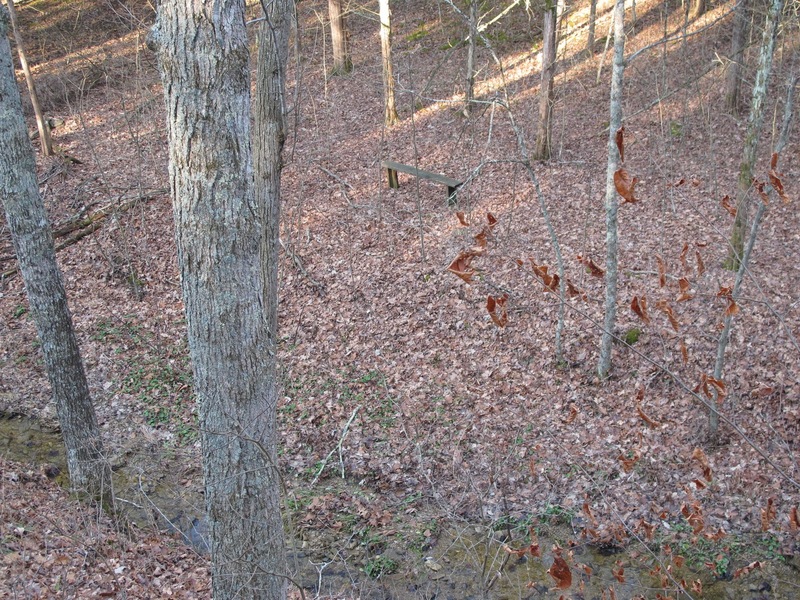 Sitting with my back to the tree allows for an excellent view of the creek and floodplain. 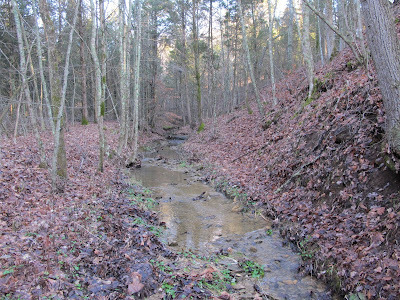 The creek hugs the toe of the slope. 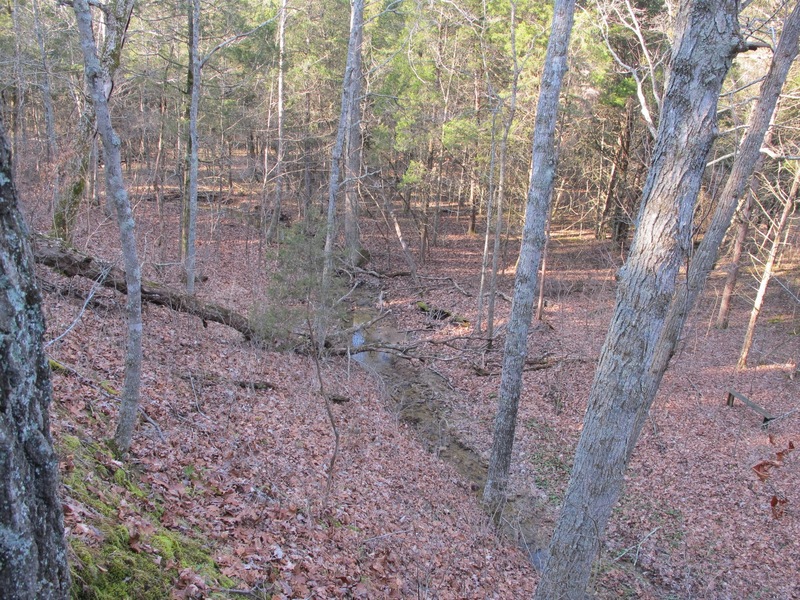 The floodplain to the right is often covered with water, but the creek makes no move in that direction. The energy of the rushing water works against the rocky slope. 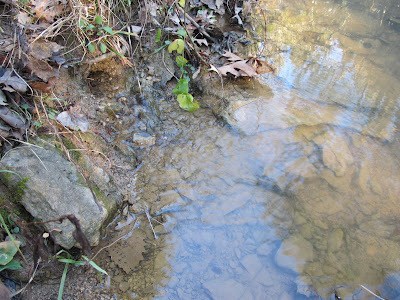 At some point, I believe the release of some large rocks into the creek will change the balance and cause the water to work against the shallow bank. It could be decades before that happens. The rocky bottom provides ideal conditions for a wealth of stream insects. Mayflies, Stoneflies, Water Pennies, Fishflies and many others abound here. The water burbles quietly through this stretch. 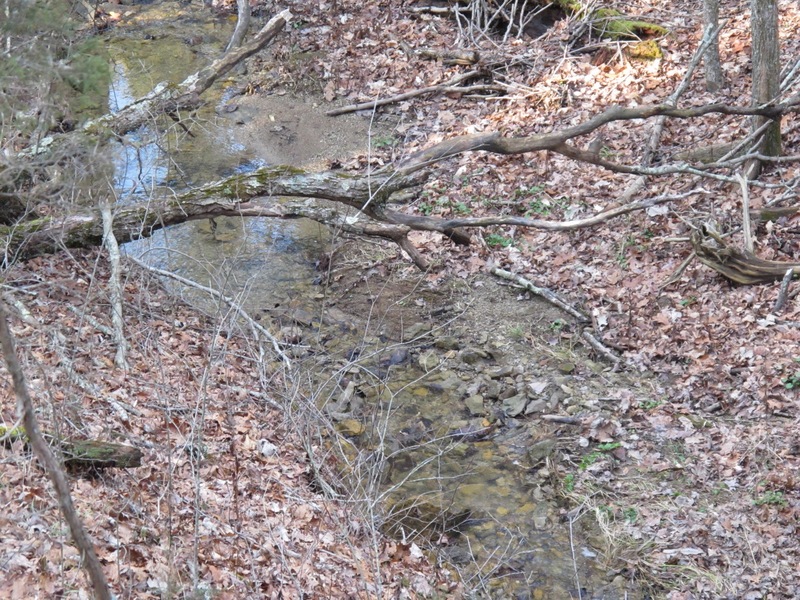 You’re aware of the sound of the stream, but it isn’t loud enough to interfere with hearing the activity in the surrounding woods. The waterfall is visible far upstream of the bench. 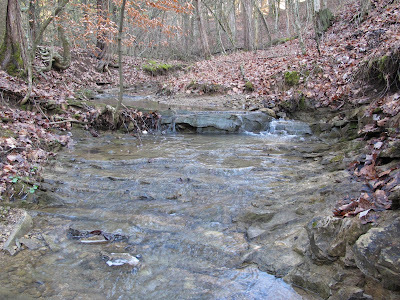 This is probably the most stable stream rock formation on the property. The solid slabs of limestone bedrock stand up well to the erosive effects of the flowing water. 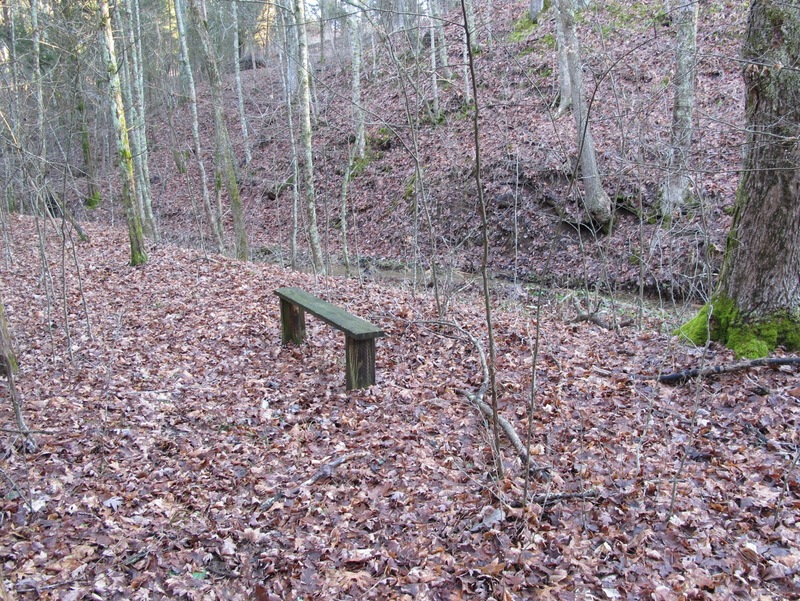 The resting bench has a great view of the creek and is a wonderful place to spend some idle time. My problem is that I can’t seem to sit for more than a few seconds before the creek entices me into the channel. Water that sustains a stream comes from underground. Water from rainfall and snow melt filter down through the earth. 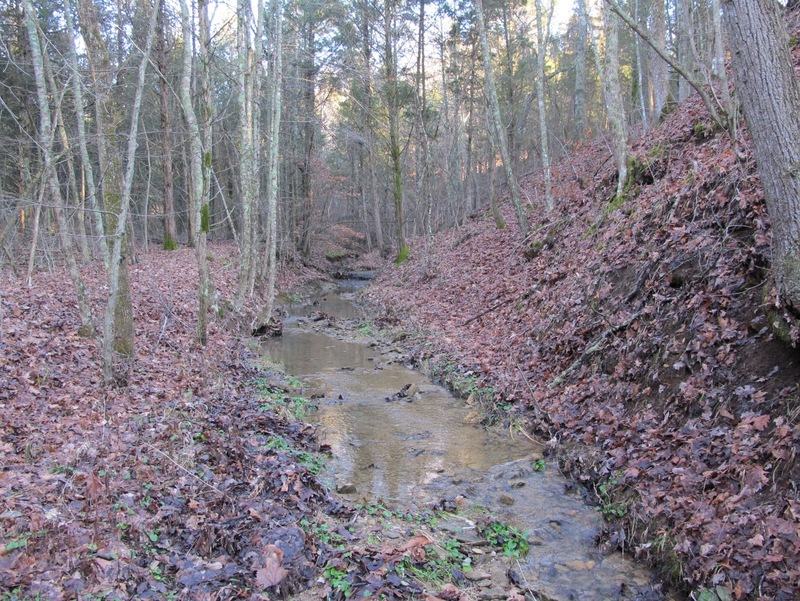 When the water in the soil reaches an elevation higher than the stream bed, it reemerges and flows down the creek channel. These points of emergence are normally ill defined and impossible to detect. 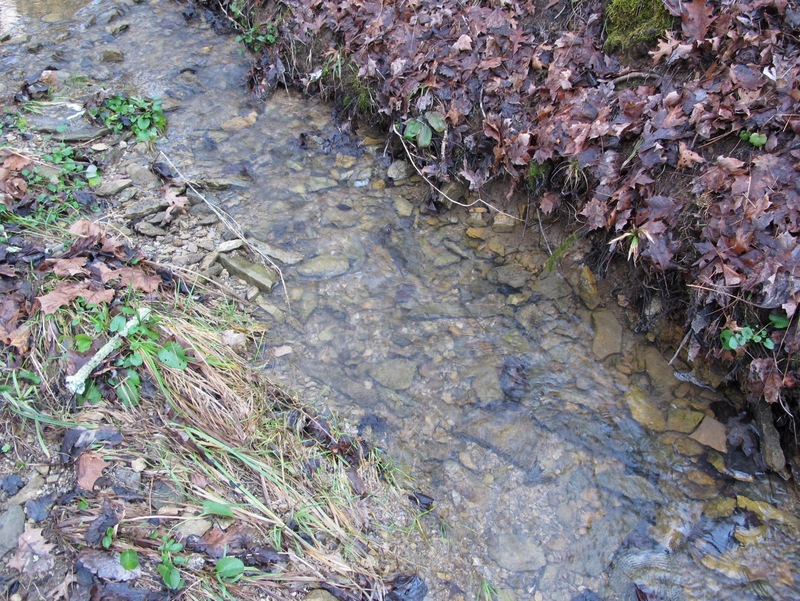 One source of water is easily detected and is referred to as a spring. 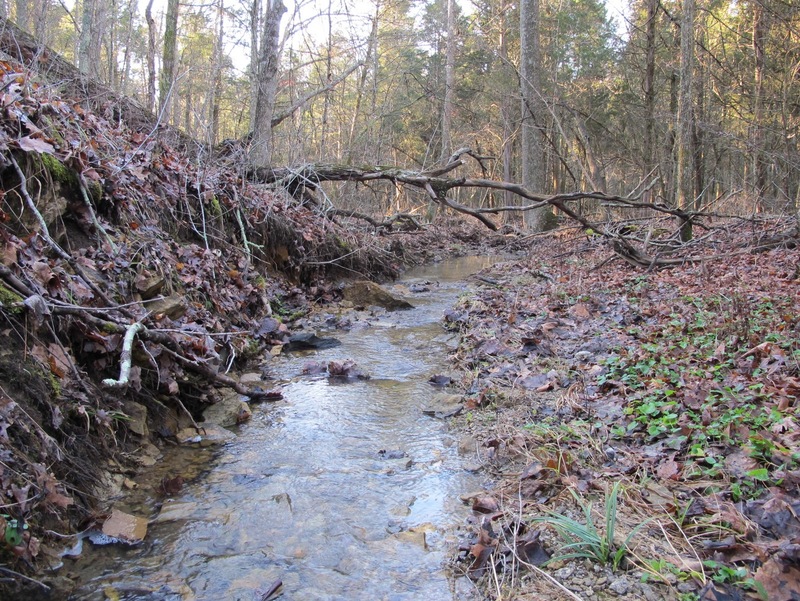 A spring is a single point where water flows from the ground. 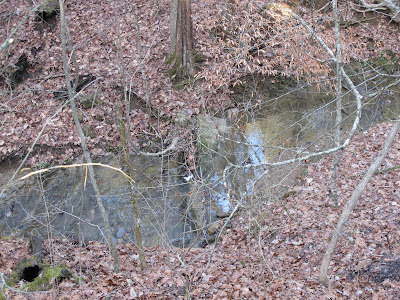 There is usually some type of noticeable hole from which a trickle of water emerges. The rate and duration of the spring flow is determined by the speed and distance the water travels through the ground before emerging. The subterranean conditions at Blue Jay Barrens allow for easy water movement. Underground channels have formed a network of arteries that carry spring water to the point of emergence. 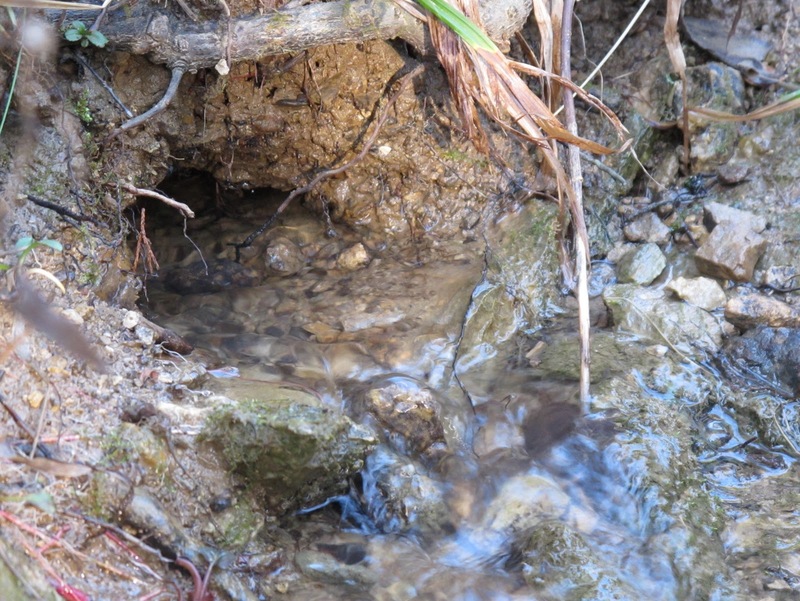 At times of heavy flow, it’s even possible to hear water gurgling along below ground. 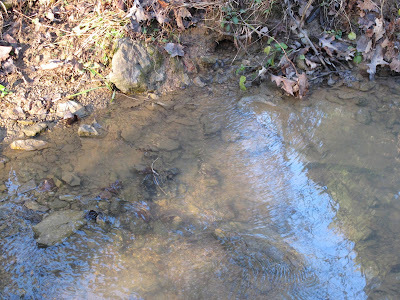 This ease of water movement means that the flow won’t last and the spring will cease to flow during the dry season. The trip through the soil leaves the water clear and clean. 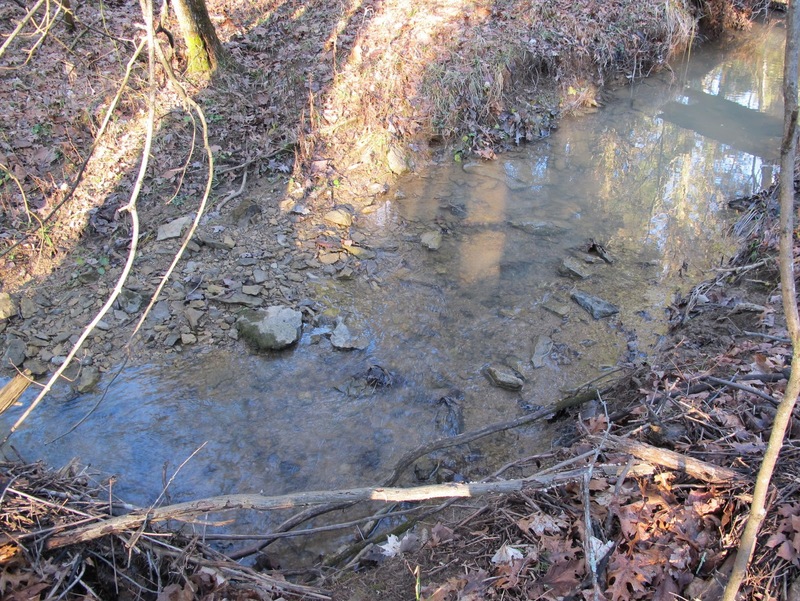 In extremely cold years, the creek is covered with ice everywhere except where warm spring water enters the channel. 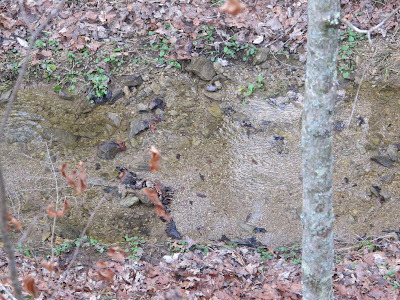 It then becomes easy to locate the springs because of the abundance of birds that flock there to drink. 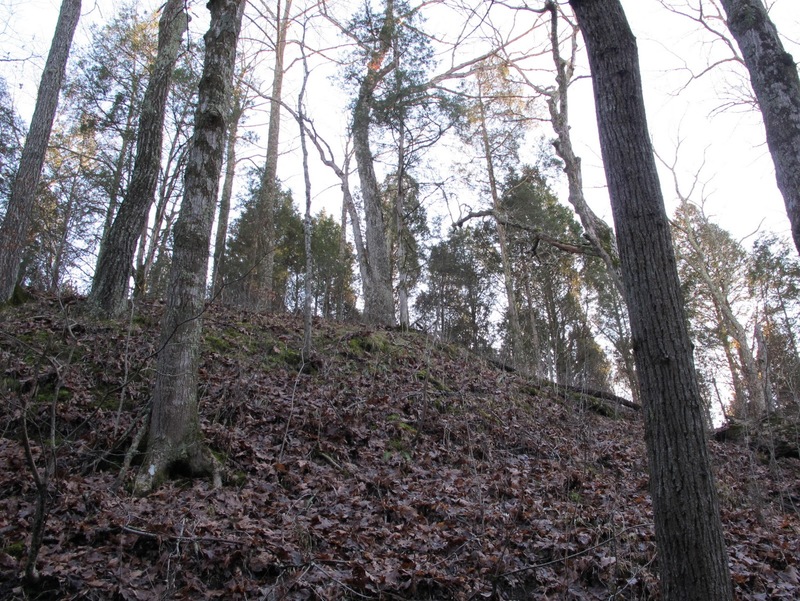 Underground channels that feed this spring form a tiny cave system beneath the soil. 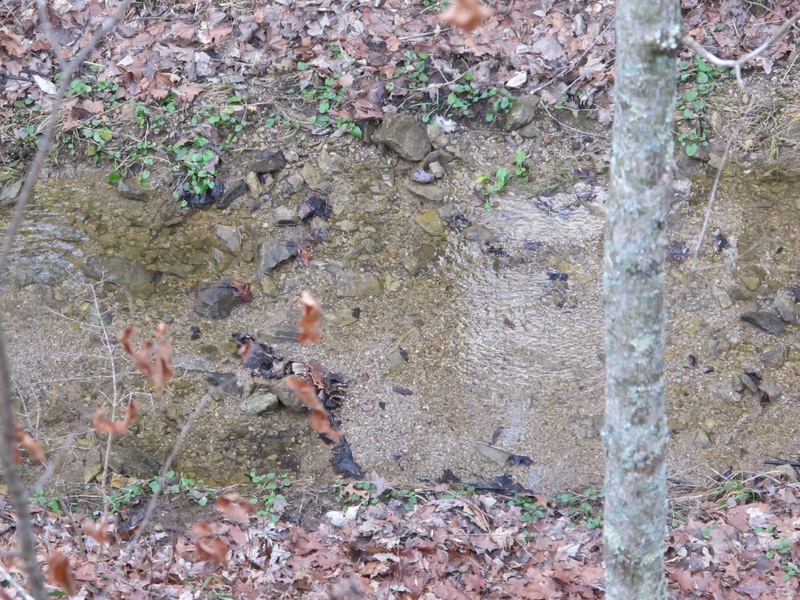 There have been many times that I’ve seen Jefferson, Smallmouth and Streamside salamanders disappear into springs. I would imagine this to be an ideal environment for subterranean salamanders such as these. 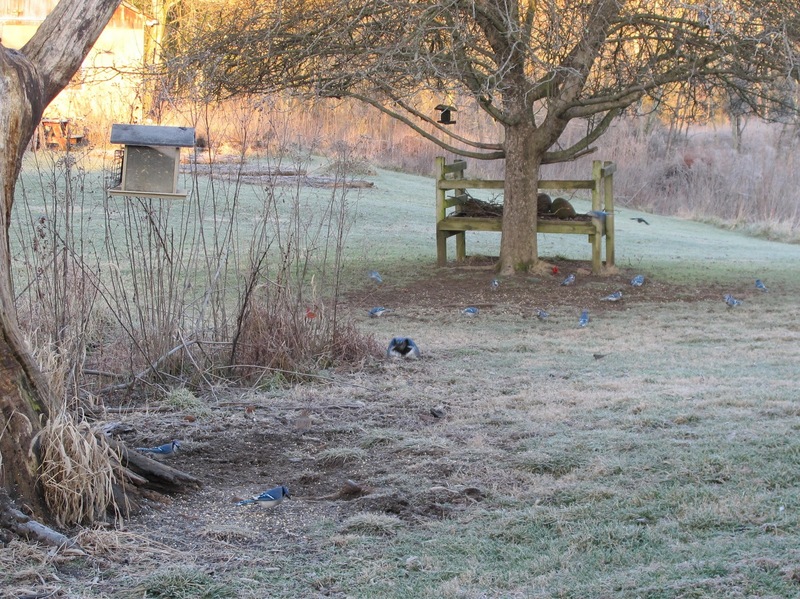 It’s often suggested that I prune or remove misshapen or damaged trees from Blue Jay Barrens. If I was landscaping a lawn, I might engage in such activities. In a natural setting, there are always trees that don’t conform to the arborist’s standards. I enjoy the unusual shapes and would never remove something just because it was different. 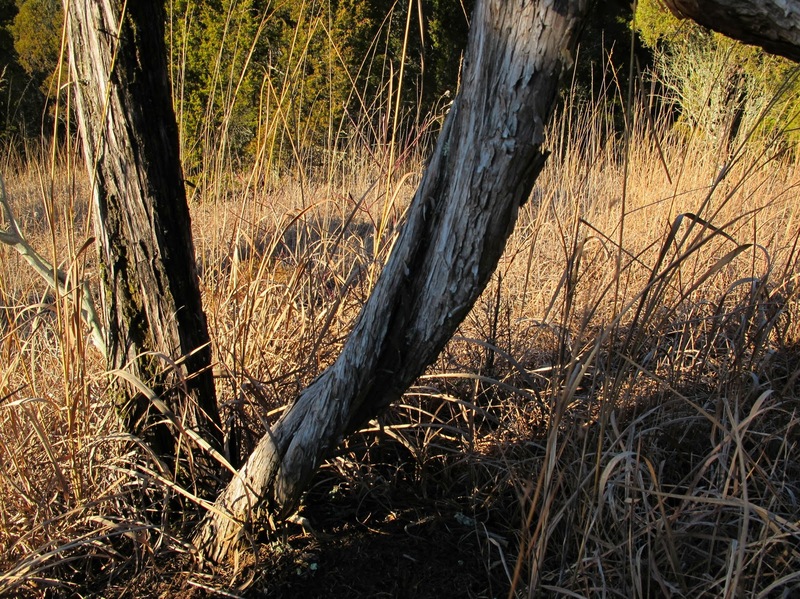 This cedar has overcome an almost fatal disaster and now claims space on a rough patch of prairie. I can’t be certain, but I feel that the first step on the road to deformity came when the cedar was twisted by a violent wind. The trunk shows one complete spiral between the ground and the bend. The bend most likely occurred at the same time as the twist. It’s likely that the trunk broke as the tree was twisting. The top would have then provided more leverage and made it easier for the wind to complete a full twist. 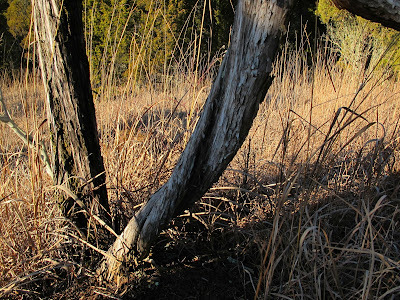 The pressure on the outside of the bend caused the bark to split and peel to each side. The pinched area on the inside of the bend began growing together and now appears as a seamless join. 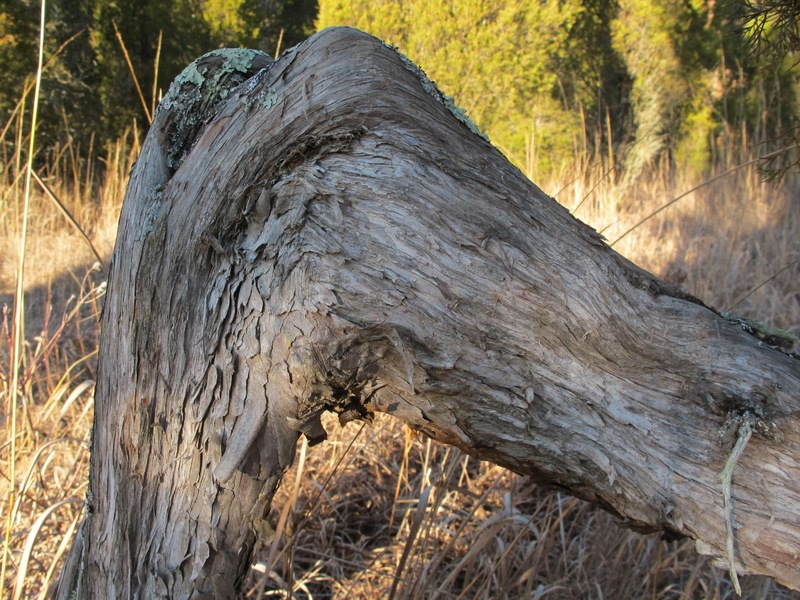 When viewed from above, the bend shows the exposed heart wood of the trunk. Slow growing cedars on the dry prairies produce a very decay resistant inner wood. 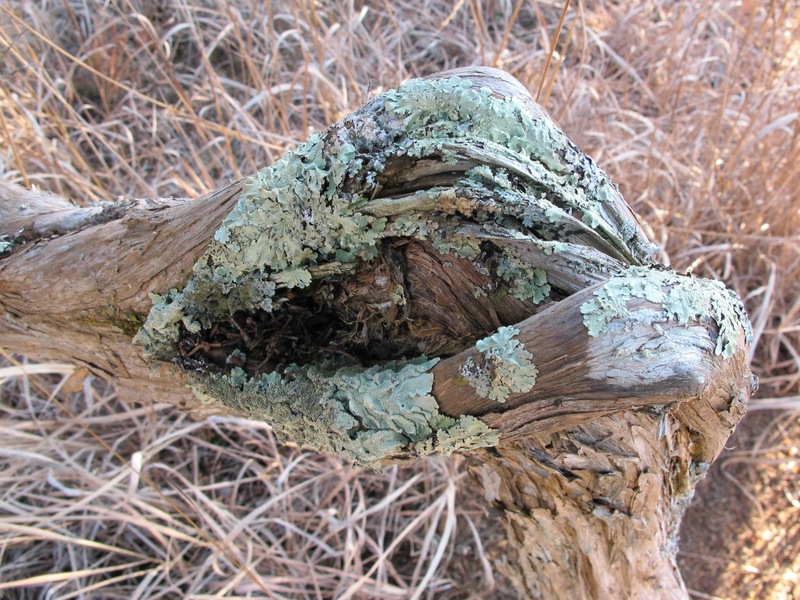 Even though it has been exposed to the elements for more than 20 years, the wood shows no signs of rotting. 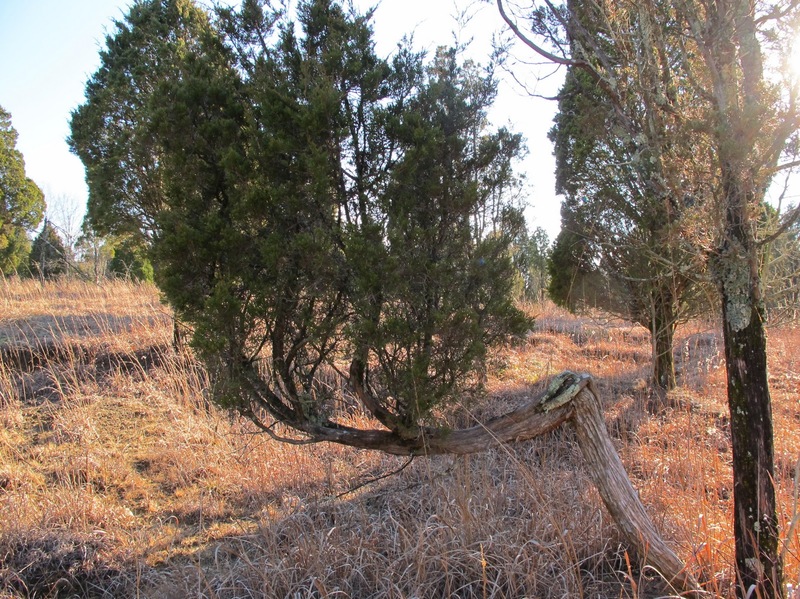 Branches of fallen cedars often have a difficult time reorienting their growth to an upward direction. The result is always an interesting freestyle sculpture. This particular specimen reminds me of Mammoth tusks and deer antlers. 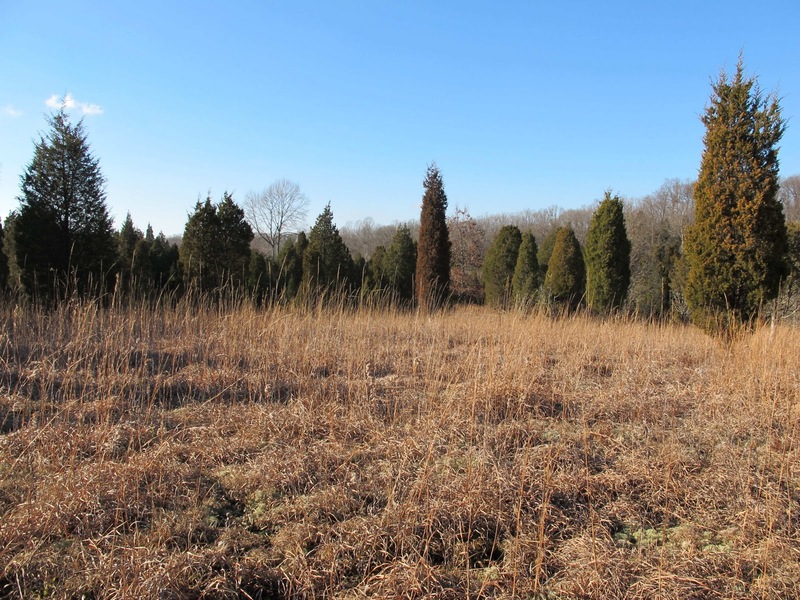 If I was looking for something to liven up the yard, I don’t think I could do any better than some of these odd shaped cedars. I took a short afternoon walk on Christmas day to check out the condition of the prairies. It’s been an odd season so far. There have been no accumulating snows and no long periods of excessively cold temperatures. Daytime temperatures have recently been in the 40’s or above and rain has occurred every few days. The prairies look much as they did two months ago. 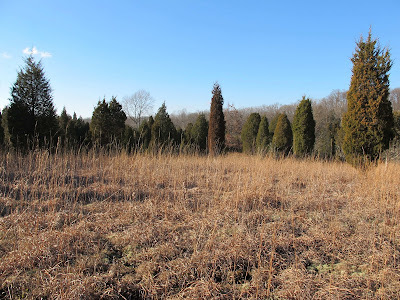 Even the less stout grasses are still standing tall. We would normally have had at least one significant snow by now. The grass stalks should be showing the effects of bearing that snow load. 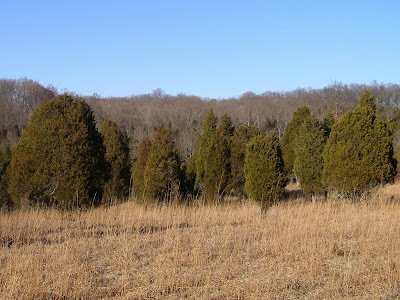 Eastern Red Cedars are still showing a lot of green, but there are a few patches of red and brown showing up. 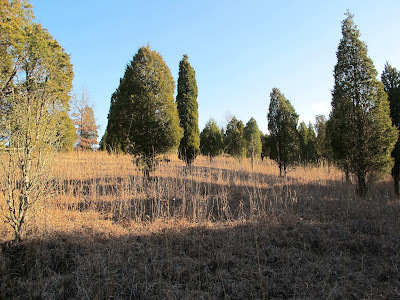 The stresses of winter can slow the process of photosynthesis within the cedar leaves. 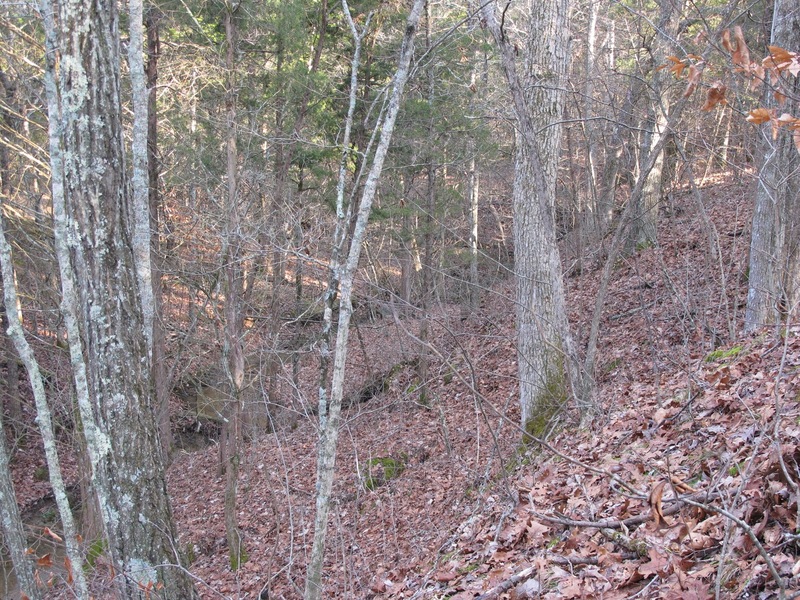 Reduced levels of chlorophyll in the leaves means less green coloration on the tree. 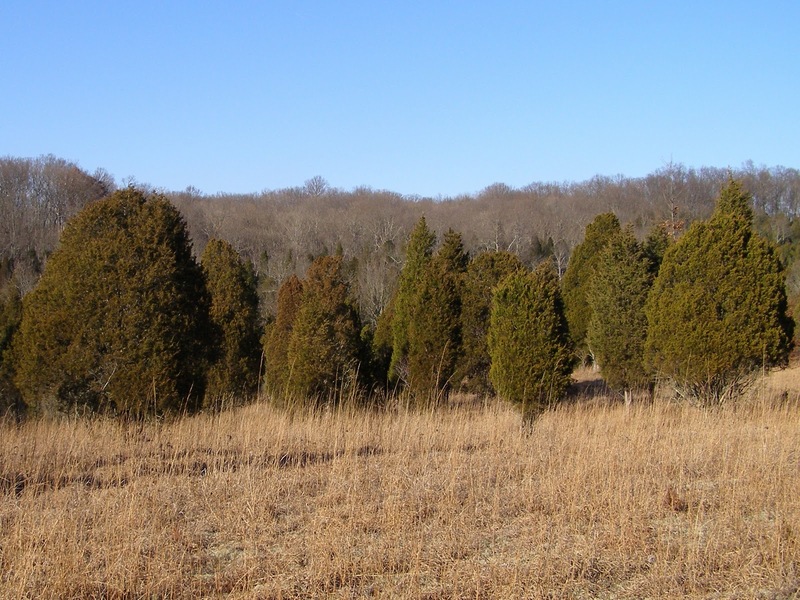 Whether it’s the individual genetic makeup of the tree or the conditions specific to the site, some trees consistently show early signs of stress regardless of the weather. This pillar shaped cedar stands apart from the others and is always bright red by this time of year. It will look this way all winter, but will once again be bright green next spring. Christmas was a pleasant day for a walk. Temperatures were in the in the low 40’s and the sun was bright and cheery. A strong breeze kept the cedars in constant motion. 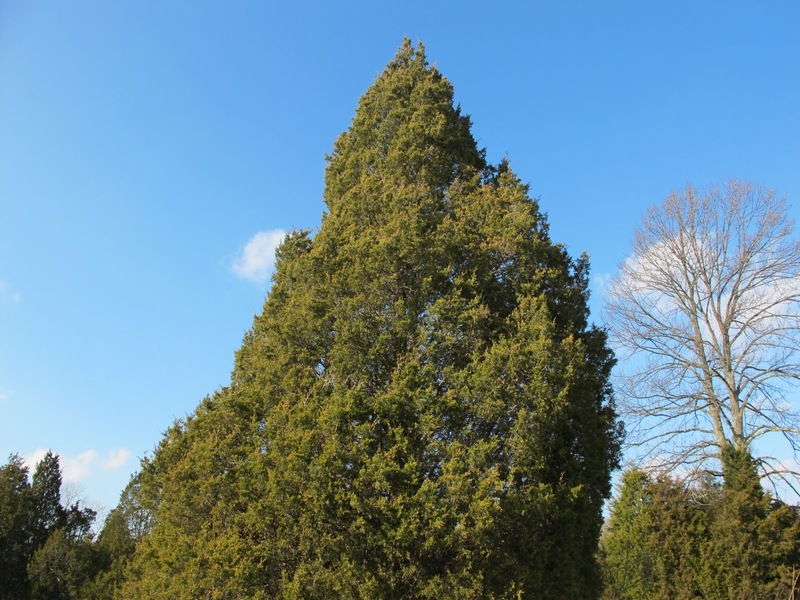 That leftward lean to the cedars is wind induced. A small plane passed over several times while I was out. It’s common for local pilots to charter flights to view the Serpent Mound located about a mile west of here. I’m guessing that someone got such a flight as a Christmas gift. As the planes swing around to make another pass over the Mound, they commonly travel through the skies of Blue Jay Barrens. Sometimes they actually circle me as I work. I don’t know how interesting I am from the air, but I like to think that my antics add some value to the experience. 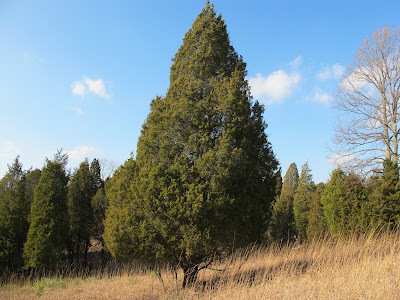 The tall cedars of the prairies always look large and impenetrable. They’re like granite monuments intended to occupy a solid space that is inviolable by anything that might approach. In some ways they perform just such a function and are living landmarks that have survived the many changes around them. 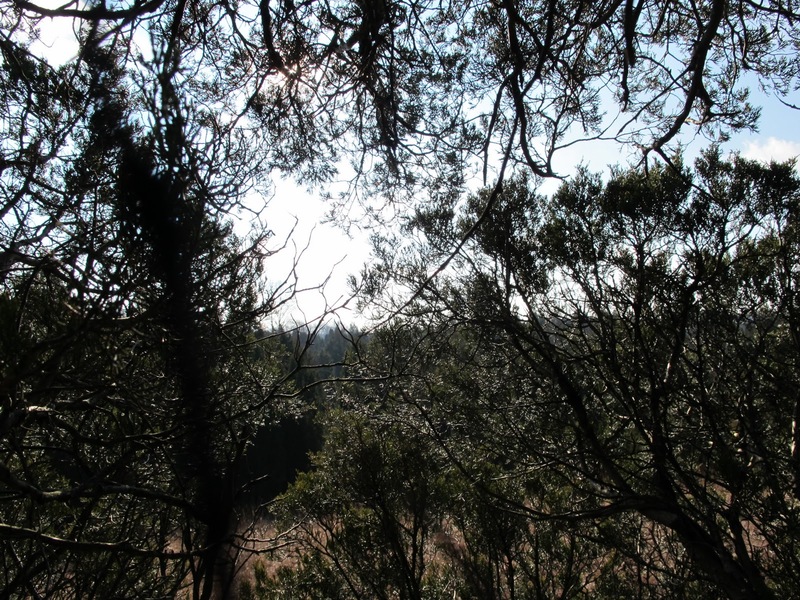 On closer inspection, small patches of sky can be perceived through the cedar canopy. The tree appears less solid than it did from afar. From inside, the tree seems almost light and airy. Plenty of room in here, if you can maneuver around the branches. The upper part of the tree is a favorite roost site of hawks and owls. A fine selection of suitable perches here, good protection from the elements and a nice visual screen to hide the birds of prey from bothersome crows. 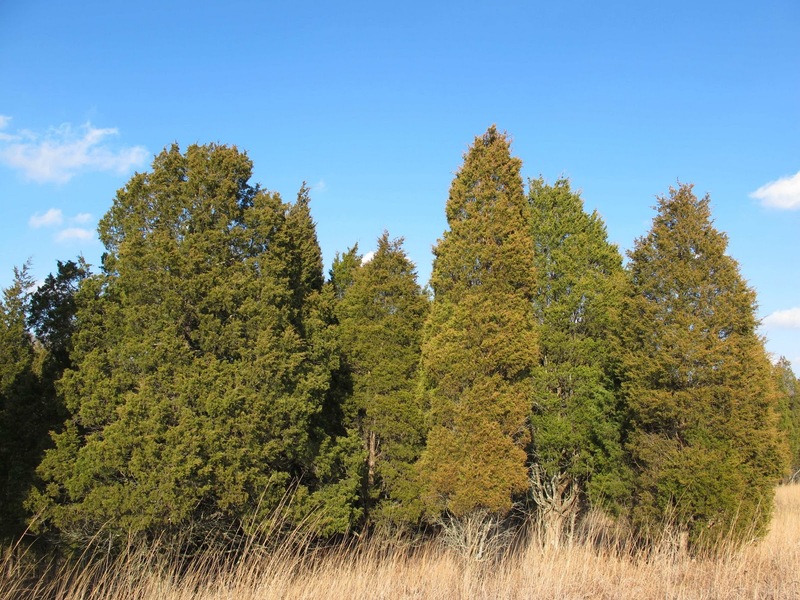 When birds feast on cedar berries, it’s inside the canopy that they sit to enjoy their feast. Squirrels nest inside the cedars and move from tree to tree without being seen by predators. It’s well worth the time to stick your head inside the branches of a few cedars to see what might be living inside. Even if all you see is cedar, it’s from a perspective that offers its own unique qualities that are equally attractive as the covering of green foliage seen from the outside. My property was named Blue Jay Barrens because Blue Jays and Barrens were two things that I could count on seeing any day of the year. Blue Jays are still plentiful and are especially noticeable when they come to the house for their morning feeding. 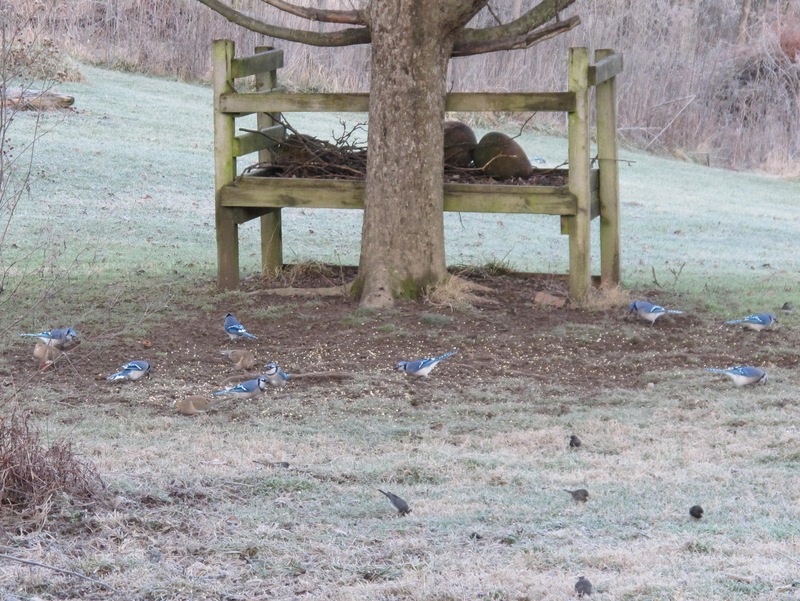 I’ve tried on numerous occasions, but I’ve never been able to get an accurate count of Blue Jays in the yard. For one thing, they never stay still. There are always birds moving to and from the feeding area. When numbers do build up on the ground, something spooks them into flying off in all directions. They also spread out over a fairly large area. They’re at both feeding stations, scattered across the lawn, in nearby trees and sitting in trees up to 150 yards away. Constant movement between these various areas makes it impossible to have any confidence in my count. Even when they’re on the ground, they’re not always easily seen. You never know how many are hidden behind one of the trees. I guess that I’ll just have to stick with my estimate that there are a bunch of Blue Jays living at Blue Jay Barrens and not get too concerned with the actual number. 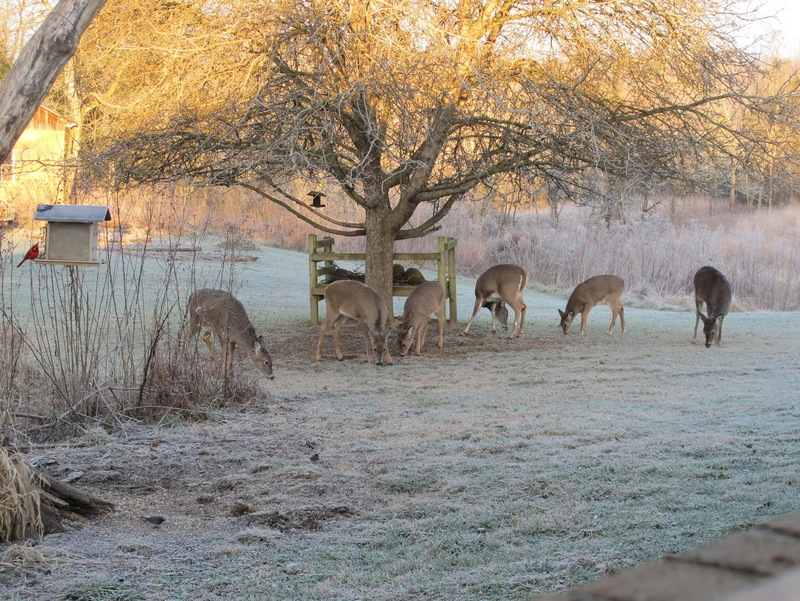 Just seeing them surround the house is a pretty good Christmas present. The Wild Turkey hens have been slowly aggregating into larger flocks. Flock size is nowhere near what it will be in late winter, but I’m sure it will be impressive when all of the smaller flocks finally get together. 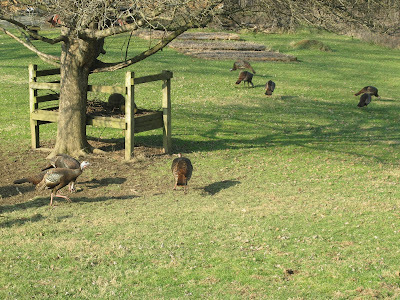 Regardless of flock size, the feeder area is a standard gathering area for the turkeys. 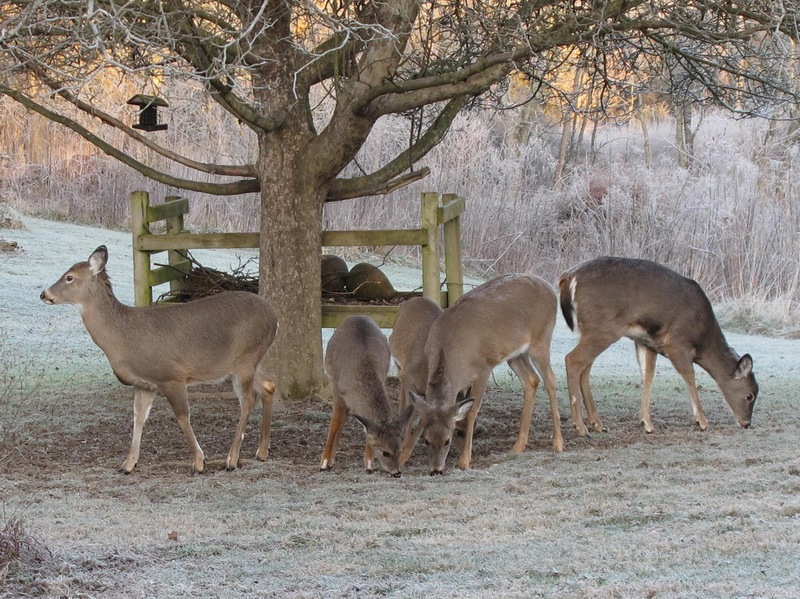 The lawn seems to be a greater attraction than the handful of grain they can glean from the feeder. The non-native lawn grasses stay green well into winter and continue to grow as long as the ground remains unfrozen. 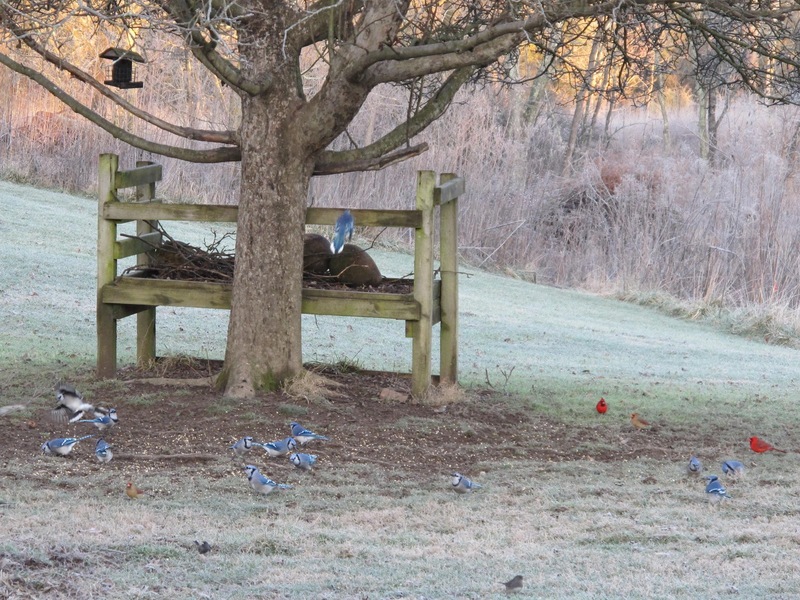 At this time of year, the lawn is the largest concentration of green leaves at Blue Jay Barrens. 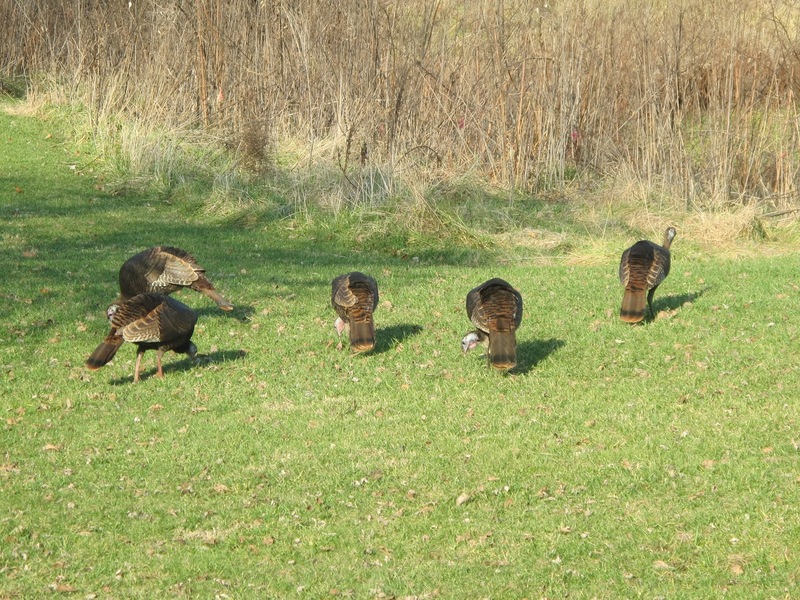 The flock will typically spend an hour or more roaming the yard and picking blades of grass. With groundskeepers like these, you don’t have to worry about your lawn looking raggedy during the winter. 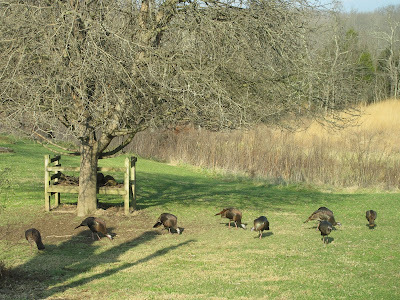 The turkeys cycle between grazing and searching for cracked corn chips. When the flock gets larger, the dominant hens will monopolize the corn area and the rest of the birds will have the yard. 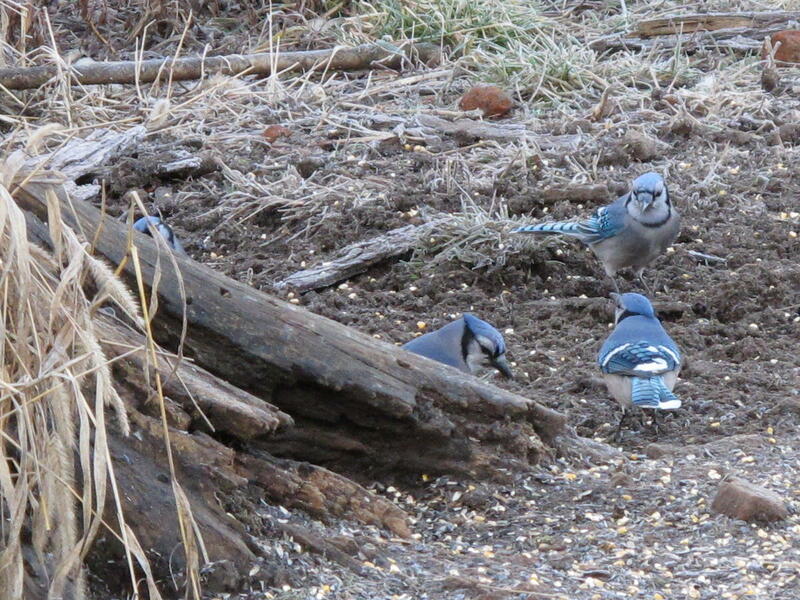 There are some subordinate members of the flock that don’t even try for corn. They immediately head for the lawn and spend their entire stay eating grass. There are two bearded hens this winter. This is the younger. I’ve seen the older guarding chicks for the last three seasons. This may be one of her young. There must be a little bit of hunting dog in this hen. She seems to have gone to point. This hen seems embarrassed to be caught preening. I guess I should have made it clear that the photo shoot was not over. 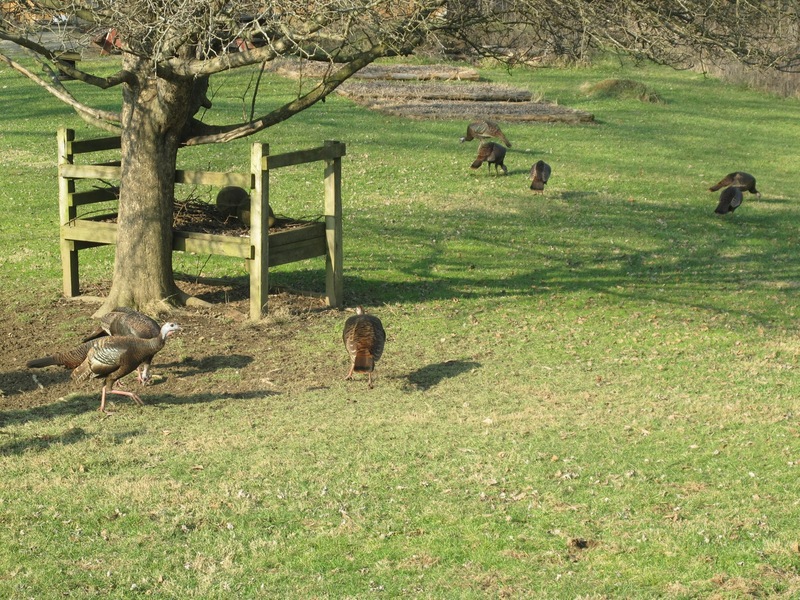 The turkeys are always a lot of fun to watch. In between the rains, we’ve had some beautiful sunny afternoons. 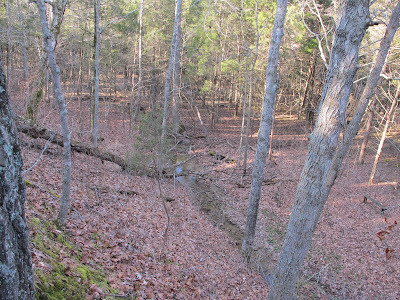 I took a little break to relax on the bluff overlooking the creek. This is one of my favorite places to sit, despite the fact that I rarely see any birds or other animals from this vantage point. Things are particularly attractive at this time of year. By the time spring arrives, floods and snow will have made a mess of the leaves in the floodplain. 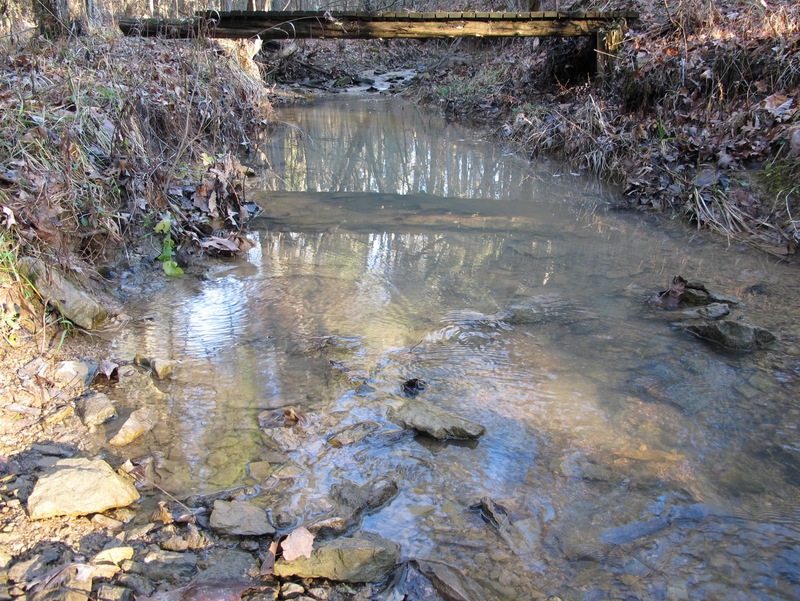 This fallen tree once formed a dam that resulted in the creek filling with gravel. 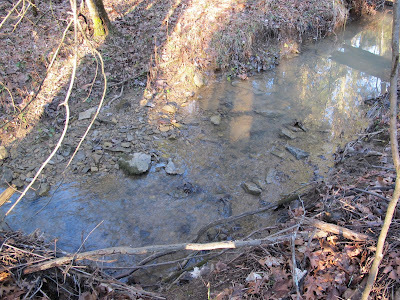 The obstructing branches were torn away in a flood, so the creek has returned to its earlier stone bottom. I personally find this condition to more attractive. 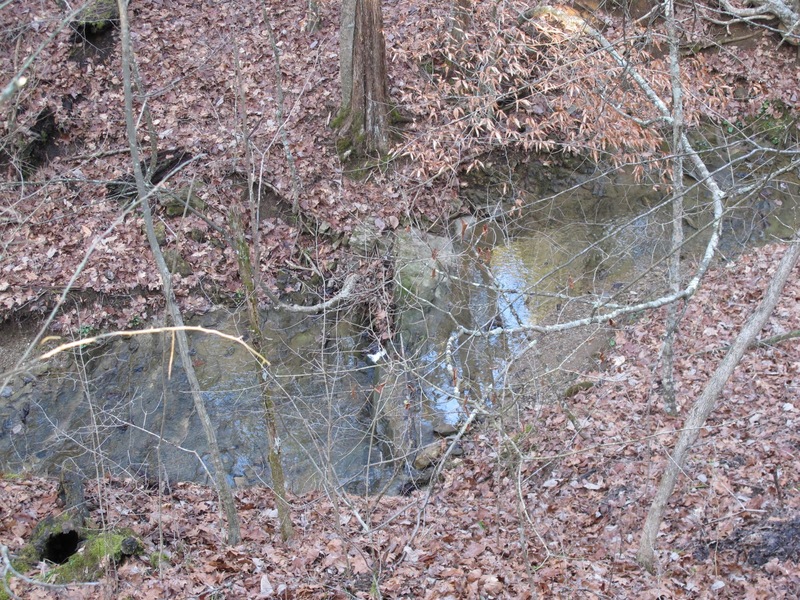 The upstream view is partially hidden by the trees, but the creek is still visible. The water is quite clear and the stones are particularly clean this year. 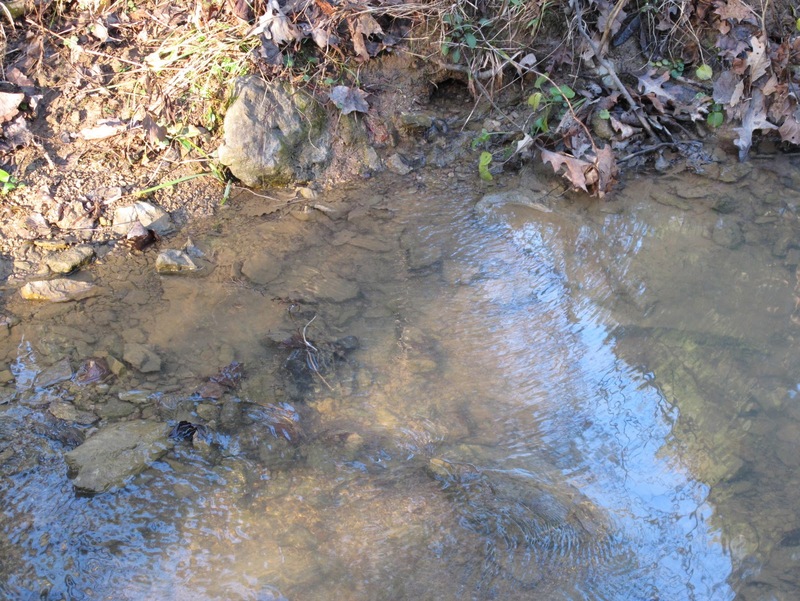 There have been years in the past when manure from cattle grazing in upstream pastures has increased fertility levels in the water and caused algae to cover the rocks. Cattle numbers have since been reduced and nutrient levels have dropped to more natural levels. The waterfall is producing a merry splash and gurgle. The sound sometimes carries quite a distance. My resting bench looks rather lonely down there by the trail. I purposely kept the bench away from the vicinity of the waterfall, so I could hear what was happening in the surrounding woodland. I enjoy the sound of the waterfall, but it can be a little overpowering at times.